2. Date the goal. That way all goals can be tracked and they'll know if they are missing a day. 3. Model the process. Use a learning goal page for yourself and show the kids how they should go about writing and reflecting. 4. Give options for how to accomplish the goal if they didn't in class. Some kids will say "I don't know what to do" if you don't give them tips like going online or asking a friend for help. 5. Get them to use a tracker often. During class it should be accessible as well as during homework time. This way if they have any questions and you're not around they won't forget the question. 6. Write down the goal from their perspective. Them copying "I will be able to..." is much more powerful than you writing "You will learn how...". 10. Finally, and most importantly. 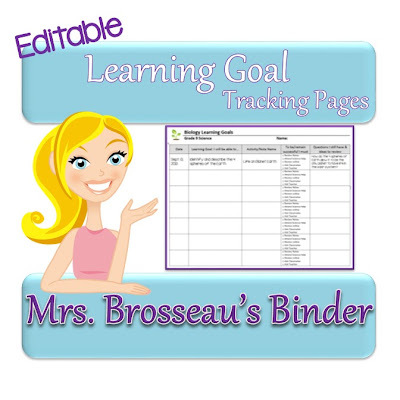 Photocopy the learning goal trackers onto bright, colorful paper. I can't stress this enough! If you know me personally, you know how much I value color in students' binders. If you want them to use it, never lose it and refer to it often then you'd better offer it on some colorful paper. I use bright green for Biology, bright blue for Astronomy, bright yellow for Electricity and bright pink for Chemistry in Grade 9 Science. In addition to the learning goal page, other really important documents (newsletters, test outlines, project rubrics, etc.) are copied in the same color for that unit. If you're ready to start using a learning goal tracker, start with my editable version at my TpT store. It's free! P.S. 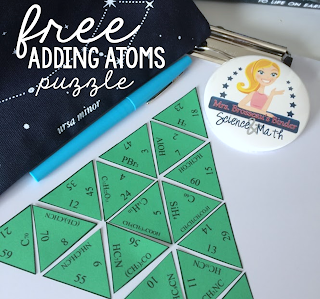 Don't forget to enter the giveaway for a free bingo game! Thank you so much! Have a great night!